It’s important to oil your sewing machine from time to time. Be it a Brother sewing machine, a Singer sewing machine or a Janome sewing machine, they all need to be cleaned, oiled and have their maintenance needs taken care of regularly. This would help your machine perform better and prevent any common sewing machine issues, as well as make it run more quietly. So let us guide you how to oil a sewing machine and the best oil for sewing machine that you would want to use. For those wondering what is sewing machine oil: It’s basically a type of oil specifically designed for oiling your sewing machine and making it run better and its parts more functional. It’s highly recommended to go through the instruction manual before oiling your sewing machine. This is because every sewing machine brand tends to vary quite a bit from one another, and is likely to have different cleaning and lubrication requirements than the others. It’s important to read up a bit on cleaning your sewing machine as well, as cleaning the machine before you oil it usually helps get the best results. However, you should also keep in mind that you need to clean your machine much more often, preferably every week or so, depending on your sewing machine brand. Similarly, there are some sewing machine models that don’t require oiling. They usually come with a “self-lubricating” mechanism. However, they may still need to be maintained, but the instruction manual may say that it’s not recommended to oil them at home. If it does, then you should obviously not try to oil the machine yourself, and rather leave it to a professional or do as the manual says. If you don’t have the instruction manual for your sewing machine, you can download it from the official website of your sewing machine brand. 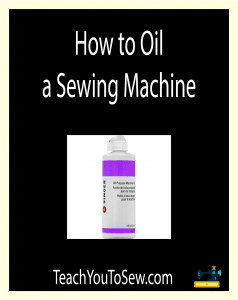 If you’re trying to learn how to oil sewing machine, then let us tell you that one of the most important components of the oiling process is going to be the oil product you use for oiling your machine. Car oil is an absolute no here, and you need to be very specific with what you use here. So let us discuss a bit about what kind of oiling product you should be using for this purpose. The oiling ingredients commonly used for oiling a sewing machine have typically been things derived from petroleum, primarily something that are often known as petrochemicals. They mainly contain ingredients and minerals commonly associated with crude oil, and petroleum products in particular. While these oiling ingredients are widely used for industrial purposes and as an industrial sewing machine oil, they are something you would want to be careful with when using at home. This is because excessive exposure to them has been linked to several skin issues. However, you will also have to make sure that you buy an oil product specifically designed for sewing machines. It would look clear and typically comes in a small bottle. Many sewing machines come with a small bottle of sewing machine. Needless to mention, you would want to stick to an oil product that’s recommended based on the information mentioned in your machine’s instruction manual. Sewing machine oil products can be found both at sewing and fabric shops as well as online. It may be easier to find what you’re looking for online, though, as you tend to find a much better variety than a fabric shop. That all said, you may also have the option of using a sewing machine oil substitute. And it can simply be the household oils you will find in your kitchen. They are safe, inexpensive, and a pretty good alternative for typical sewing oil products. These oils may include coconut oil, olive oil and silicone oil. While any one of them may work, you may get better results if you use a mixture of the three. However, if you’re looking for the best sewing machine oil, then you may want to go for this product right here. It’s safer than all those industrial, petroleum-based oils and wouldn’t cause any damage to your machine which those industrial oil products could, and much more efficient than household oils. It’s not only fit to be used as a Brother sewing machine oil or a Singer sewing machine oil, but for a variety of household appliances. Choosing the right sewing machine oil is not enough. You need to educate yourself on how to use it the right way to get the desired results. The first thing to keep in mind here is that you should only be using a very small amount of oil, at least initially. This will help you make sure what you’re using is actually fit to be used for your machine, and help protect it against any kind of damage in case the oil you’re using doesn’t turn out to be what you should have been using for your machine. Similarly, using a higher amount of oil may negatively impact the overall functionality of your sewing machine, as the excessive oil may make it difficult for the internal components to do their job properly. Using an excessive amount of oil would also make the usual cleaning of your machine a more challenging task. Where to oil sewing machine? So you would ideally want to use only a few drops of the oil on the parts of your sewing machine, The parts to be oiled would be the ones that move when the sewing machine is running. If you feel confused about a particular part, simply oil all the parts that rub against another part when the machine is in use. Some specific parts to be focused on during the oiling process include the housing unit that houses the bobbin case, the shuttle hook or the hook race which holds the bobbin hook in place, the ring-like thing on the outside of the bobbin hook and other individual parts as explained above. You may want to refer to the instruction manual as it often includes specific information on which parts of your particular sewing machine model to oil. This is especially true if you’re wondering how to oil a Singer sewing machine, as Singer offers way too many different models to have a general oiling process that works just as well for all of them. 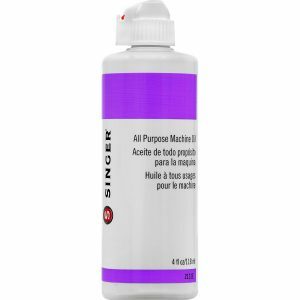 Again, we recommend that you use Singer Machine Oil. It’s inexpensive when you buy it from Amazon.com. Click this link to go to the product.